Flapjacks are a bit of a nemesis of mine... no matter how many times I make them they are never quite right. They are either too dry and crumble, or two sticky, gooey or heavy. I am desperate to find the perfect recipe. In my mind the perfect flapjack should keep its shape well, be slightly crisp on the top, but soft and slightly chewy in the middle. My boyfriend is a huge flapjack fan, so in an ideal world I would like to make him flapjacks to go in his packed lunch everyday. So of course they can't be too sugary or fat-filled. Something healthy yet totally yummy... Maybe I am asking for a bit much. These flapjacks are certainly not healthy, with 100g of condensed milk giving it is rich flavour and soft texture. 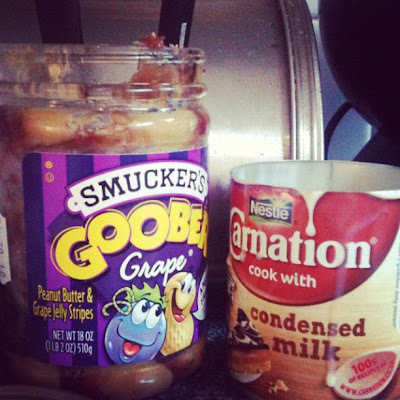 The original recipe asked for peanut butter but the only thing I had in the cupboard was a jar of Smucker's peanut butter and grape jelly swirl. I decided to use it, whats the worse that can happen? I fiddled with the ingredients for mine, as I didn't want to go shopping so used what I had to hand. 160g Smuckers Peanut and Grape Jelly Swirl. Simply melt wet ingredients in a saucepan (peanut butter, butter, condensed milk, sugar, syrup), take of the heat and chuck in your oats and raisins. Stir until fully combined and then dollop into a lined tin and flatten down, be sure its smooshed right into the corners of the pan. Bake at 180C for 20 mins, until the top is browned slightly. Leave to cool in the pan for a while, then cut into desired sizes. These flapjacks were gorgeous, really rich and dense with a lovely nutty undertone from the peanut butter. However, I am not sure it is the perfect recipe I have been searching for. These would be fantastic for an occasional treat but a little too unhealthy for a packed lunch staple. It would seem my search for the perfect flapjack continues, do you have a favourite recipe? Or maybe a tip to share? Help me with some serious girlfriend points please? Could you taste the grape flavouring? I don't think ANY flapjacks could be healthy - for me they're an occasional treat. But that'd probably said of any baking I do really, apart from bread. Actually I say that but I only eat bread on the weekend really, and then I use Guernsey butter with sea salt crystals in! You can't really taste the grap to be honest, maybe if I made them again I would stir in jam at the end or put a jammy layer in the middle. Hi, I have a recipe that uses sunflower oil instead of butter and also bananas so the flapjacks stay quite moist. Not sure how healthy this is but I'm not sure there is such a thing as a healthy flapjack! The Smuckers Peanut and Grape Jelly Swirl looks or so wrong, but very right all at the same time. I agree re books. Have had some disasters. You would think that there was a shortage of technical editors? Or maybe money saving by the publisher? It was a gift, it was nice on toast, but the jelly part is VERY sweet. Yey, glad you liked them! If you're looking for something a bit healthier, do try the tahini flapjacks on my site, or Dan Lepard's recipe - they're so yummy. I like the addition of peanut butter which is my favourite. I made flapjacks from Lorraine Pascale's Baking made easy and they turned out beautifully. I kept it simple and plain without spices and everyone loved it. They sound like what you are looking for so do give them a go.